Regular physical activity is important during pregnancy, but there are many safety concerns that you will have to keep in mind. It is important to pay close attention to the exercise you choose as well as your diet. And don’t forget to discuss with your doctor your daily exercising routine to make sure you and your baby are not at risk for any complication! 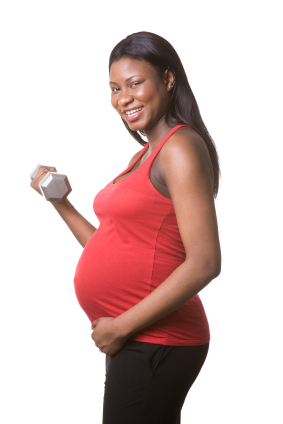 Most exercises are safe to perform during pregnancy, as long as you exercise with caution and do not overdo it. Throughout your pregnancy and mainly beyond the 7th month, non-weight-bearing activities such as swimming, bicycling and stationary cycling and those with gentle, rhythmic movements are excellent choices. On the other hand, weight-bearing exercises are any activities that you perform on your feet, putting your muscles and bones against the force of gravity. For instance, walking is a recommended weight-bearing activity during pregnancy. During the third trimester, the increasing volume and weight of the uterus moves the pregnant woman’s center of gravity forward. To counteract this and maintain stability, it is natural for the mother-to-be to lean backward. The change in posture places extra strain on the muscles, ligaments and joints in the lower back, causing pain. Exercise during pregnancy may reduce back pain, since it will help you to strengthen your back muscles. You should proceed with caution while practicing other weight-bearing activities, such as jogging, running, racquet sports, or dancing, because you are at higher risk for falls that might harm you or your baby. Activities involving high impact or reduced oxygen availability should also be avoided, especially after week 12, as are those with high risk of accidents. A few examples are horse-back riding, skiing or skating, and diving. As pregnancy progresses, some activities may become harder. The most important rule is to pay attention to what is going on physically. Levels of fatigue and breathlessness are a good guide for you to know when to stop. If you feel muscle strain or excessive fatigue, modify the moves and/or reduce the frequency of the workouts. Any exercise should be stopped at once if pain, blurry vision or dizziness is experienced. Make sure that you're eating a well-balanced diet. Normally, after the 13th week of pregnancy energy requirements increase by about 300 calories a day, even without exercise. This energy requirement is increased further when daily energy expenditure is increased through exercise. In weight-bearing exercises, such as walking, the energy requirement progressively increases with the increase in weight during the course of the pregnancy. A related consideration to calorie intake and exercise during pregnancy is adequate carbohydrate intake. Pregnant women use carbohydrates at a greater rate, both at rest and during exercise, than do non-pregnant women. Some evidence suggests that eating a low-glycemic (a measure of the speed at which a food is likely to increase the level of blood sugar in the body) diet during pregnancy may cut the risks of complications before delivery, such as gestational diabetes. It may also reduce the chances of having a high birth weight infant, which may play a role in the development of certain health problems later in his life, such as obesity (Moses et al., 2006). ü Choose whole grains. Good options include 100 percent whole wheat bread and pasta, oatmeal, barley, cracked or sprouted whole wheat products, high bran cereals, buckwheat and couscous. Limit white bread and rice, instant oatmeal, pretzels, popcorn and rice cakes. ü Eat plenty of vegetables. Low glycemic index options include peas, corn, carrots, eggplant, cauliflower, broccoli, tomatoes, green beans, lettuce, red peppers, onions, mushrooms, cabbage, sweet potatoes and lima beans. ü Incorporate fruit. In addition to containing many nutrients that are vital for the health of your baby, most options are low on the glycemic index. Watermelon and dates are two to limit, but cherries, plums, coconuts, kiwis, oranges, strawberries, grapefruit, prunes and peaches are good options. ü Choose plenty of low-fat dairy foods. Not only do they contain calcium for your growing baby's bones, but most options are low glycemic index. Yogurt, cottage cheese, and milk are healthy choices. Drink plenty of fluids, even if you don't feel thirsty! It is important to drink plenty of fluids, especially during the summer months. When the weather is hot, exercising in the early morning or late evening can help prevent you from getting overheated. If you're exercising indoors, make sure the room has enough ventilation. Also, consider using a fan to help keep you cool. Continue exercising after your baby is born! As for postpartum resumption of activities, it is known that any of the physiological and morphological changes of pregnancy persist for four to six weeks postpartum. Physical activity can be resumed gradually as soon as physically and medically safe. Work with your doctor to create a plan to go back to your active lifestyle! For nursing moms, interested on the effects of exercise on breastfeeding, we have very interesting previous posts that might help you. Click here for the first of the two posts. 1. Artal R, O’Toole, M. Guidelines of the American College of Obstetricians and Gynecologists for exercise during pregnancy and the postpartum period. Br J Sports Med. 2003;37:6–12. 2. Moses RG, Luebcke M, Davis WS, Coleman KJ, Tapsell LC, Petocz P, Brand-Miller JC. Effect of a low-glycemic-index diet during pregnancy on obstetric outcomes. Am J Clin Nutr. 2006;84:807–12. Excelente información, la compartire con una amiga q está esperando. En el mediano plazo estaremos publicando y trabajando en la traducción de la información que ya ha sido publicada en el blog en Español también! Gracias por compartirla!